I was beginning to feel like we were a little overdue for a regular grid-based tangle, thus we have Ayes. 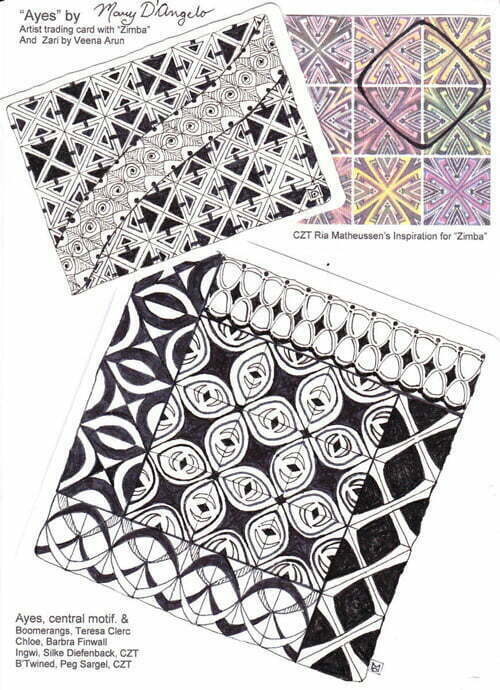 Ayes is from Pittsburgh PA tangler Mary D’Angelo who can now proudly call herself a Certified Zentangle Teacher. Mary is a member of October’s CZT32 class. My plan is to teach gratis. I have a friend who is providing the supplies for seniors to eliminate any financial concerns for the Senior Citizens Center in Carnegie. I will also to offer it to caregivers in our adult community, Cloverleaf Estates West with 500 homes. I’ve learned from Mary and her friend and colleague CZT Sue Schneider that Pittsburgh has a huge and thriving community of Zentangle enthusiasts who meet on a regular basis. “A while ago I was drawn to CZT Ria Matheussen’s, pattern Zimba. Shown below was my first try with Ria’s pattern on an artist trading card. It’s combined with Zari by Veena Arun. Included along with Ria’s graphic and fascinating tile and step-outs, was a colorful photo of her inspiration; an African pattern out of Zimbabwe. When I looked at the inspiration photo it seemed as though eyes looked back at me. Referencing Ria’s inspiration I did the colored tile, shown under the step-outs, using Prismacolor pencils. In this tile I was able to include more detail due to the size of the grid. I reworked and simplified further resulting in the third example. This simpler version and was done on a 4.5“ x 4.5” Apprentice tile. Sometimes I like to pair up somewhat similar patterns. I’ve used a bit of B’twined by Pegi Schargel, CZT, some Chloë by Barbara Finwall, Boomerangs by Teresa Clerc and Ingwi by CZT Silke Diefenback. 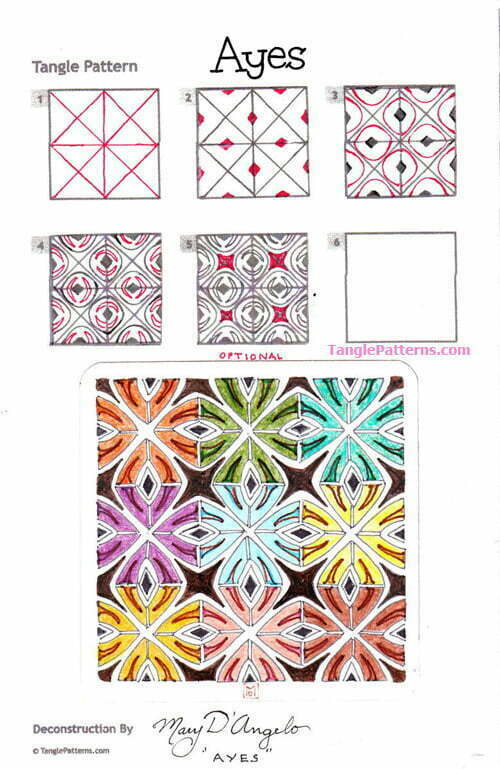 Mary illustrates the step-by-step instructions for drawing Ayes below and she features it in the colorful ZIA tile using Primsacolor pencils she describes above. Wow! Mary, I so appreciate the detail and background you’ve offered to show us how Ayes came to be. And your plan to teach for free compels me to send you a big hug through cyberspace! 🙂 I love Ria’s Zimba and look forward to playing with Ayes and seeing where it takes me. We all can inspire each other and that is wonderfull. I like this new tangle and I congratulate you for the excellent steps to become Ayes! I wish you succes with your lessons. That is very kind of you.